An online scheduling software has evolved spectacularly from the various traditional appointment booking processes and was able to come up with a definite structure to it. The USP that matters the most in the service sector, is the timely offering of the services requested. An online scheduling software plays a vital role for such a goal to be achieved on a constant basis. Selecting such an integral component of business is an important and tedious process. 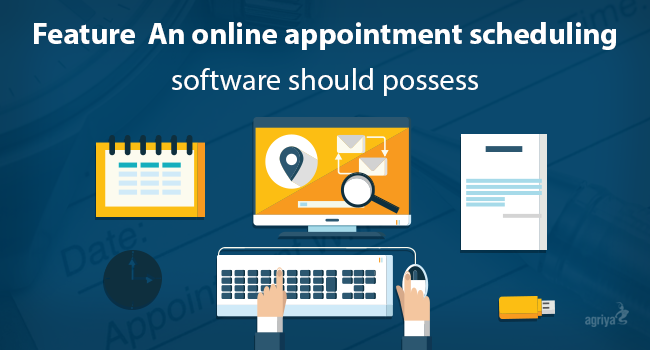 Let's discuss the important features of an appointment scheduling software, that makes it the best in the market. Real-time scheduling is what, multiple businesses are looking as the most important feature of an online appointment booking system. The customers are more inclined to book an appointment based on the real-time availability of the service provider. The booking software's calender should be able to book the appointment straightaway, rather than contacting the service providers separately to find the availability of them. Apart from this, the software should provide the end users, an easy access to the booked appointments on any platform. It's a time-consuming and complex process to track, each and every appointment booked by the customers. Again, it's the work of the software's calender to keep sending automated reminders to the users before the appointments. The software should also be able to provide value-added services like reminders for the next appointment, recommended day & date, etc. It is very important for all service-related businesses to interact with both, the service providers and the customers for a smooth operation and an online scheduling software is expected to be integrated with an efficient messaging tool to fulfill this requirement. The online appointment script should be proactive in identifying the slowest or hard-to-fill times and come up with discounts and other promotions to push business during the slowest parts of the day. Service-businesses require, most of the employees to work in-sync, in the appoint booking department. Hence the requirement here from the appointment booking script is to have a feature, that allows the businesses to decide the amount of access given to each employee. A customer managing tool allows you to collect all the data at one common place, track the booking history, identify the clients who should be awarded special incentives, etc. Every major booking software is expected to have such a tool by default. An adequate online booking software should be able to prompt the customers to write timely reviews and share them across multiple social networking platforms. It should also enable the web hosts to publish such reviews on their own websites. Apart from all this, a booking software should be easy to use. There is no point in creating a state-of-the-art software with functionalities so complex, it's even hard for the web host to operate with it. Do a complete research, identify the best software that is available and will suit the kind of market niche, you want to tap into and create a fine website.